Hi guys, Well welcome back hope everyone had a great Christmas with family and friends and managed to bring in the New Year with plenty of positive resolutions. It sure has been hectic lately with family over for the festive season, improvements to the house and of course guiding so will apologise for not up dating the blog over the past couple of weeks. Guiding has been crazy lately and I have found myself on a river pretty much everyday since Christmas which is exactly what I want at this time of year as the fishing is fantastic with so many options and perfect weather. 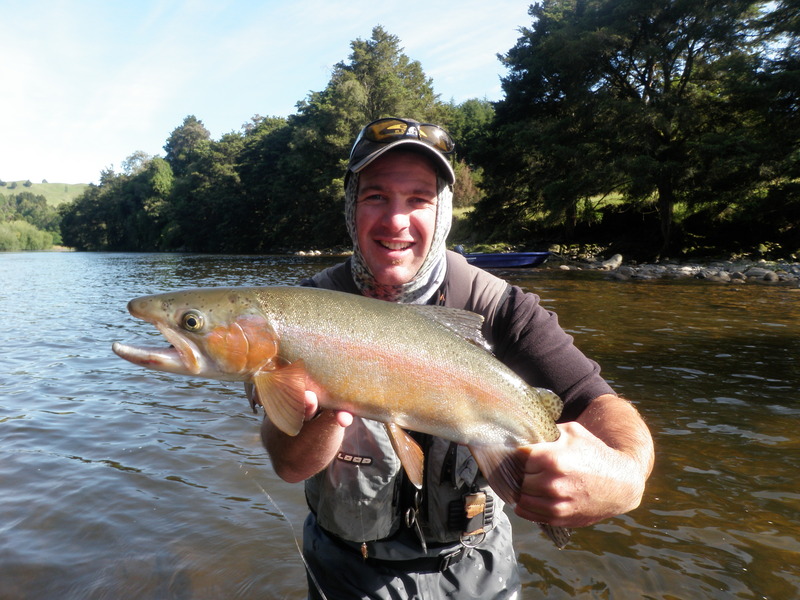 All methods of capturing trout have been working depending on the time of day and location you have been fishing with the most rewarding for most being the dry fly. Most clients this time of year ask if it is an option and in many cases it is very weather dependent and can be spasmodic on the day but if you look hard enough you can usually find a fish slurping from the surface somewhere. 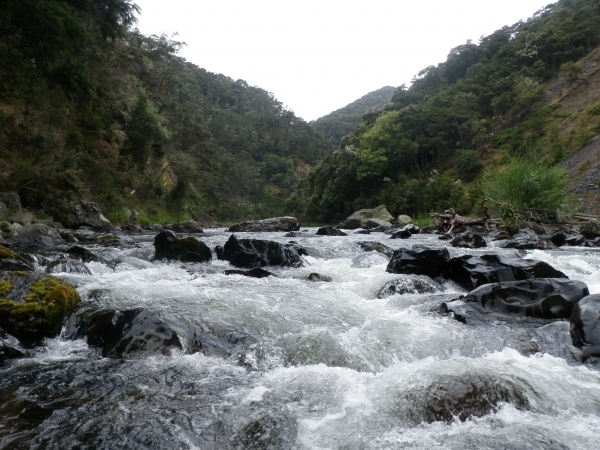 The back country is my favourite at the moment but most rivers which are easily accessed have received a flogging over the past 3 weeks with holiday makers and people with extra time off work. 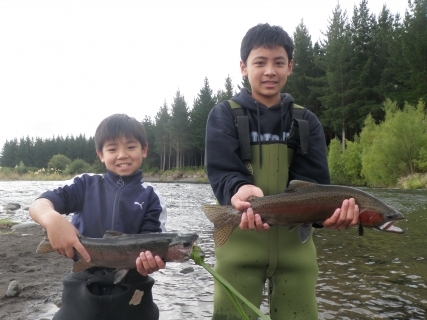 Camping on the rivers is popular with families and this usually brings the dreaded spin fisherman which we just have to accept at this time of year as they areÂ entitled to us much of the river as fly fisherman with the correct licence. I think if I could have half a day with any spin fisherman they could be converted to the gentle elegant sport of fly fishing as it is so much more rewarding fooling fish with something you have tied yourself. 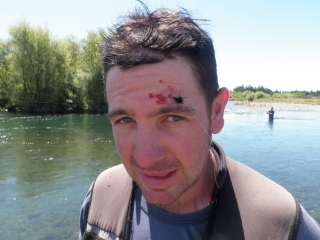 I would love to see rivers such as the Wanganui and Whakapapa altered to only fly fishing as this would surely boost trout stocks and rise the average size of fish considerably. Most of my time has been spent on the Waipunga, Mohaka,Â Whiranaki and the Whakapapa depending on varying levels of the rivers due to rain. 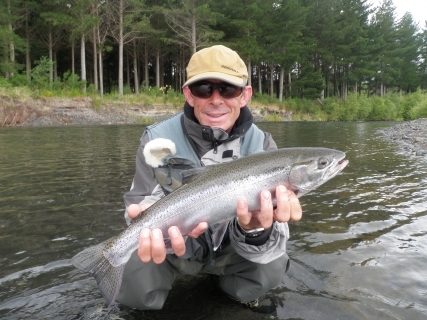 Living in Taupo really is fantastic as we have relatively short drives to all these rivers and if one is out due to rain you can always drive over to the next and begin fishing as the catchments between them are very different in some cases. The majority of my fishing has still been nymphing with long tapered fluro leaders with small natural nymphs suspended below a weighted or beaded fly depending on what depth I need to achieve. Occasionally I will use a dry as my indicator with a small nymph trailing behind, I find this especially effective in shallow fast water where you don’t need to get down very deepÂ but just have to give the fish an option to take it quickly or let it float on by. We are still yet to see good dry fly action in my opinion and still need another couple of weeks of consistent hot weather to really encourage fish to the surface or at least be looking up all day. If I see a rise at the moment I will stop what I am doing and observe closely and will only be tempted to quickly run a dry over the top of him afterÂ I see him confidently rise 3 times.Â Ok that’s enough on the back country – Â certain people will get upset with me telling you all the secrets that only guides know about. Taupo region has actually been the quietest of rivers over the holidays and has been really productive to those who have ventured up rivers such as the Hine and the mighty Tongariro. I have not done a lot of fishing in the Hine of late but I do believe the evening rise is starting to become quite spectacular in here and is well worth a visit from 6pm onwards.. Fish size is not that great and some of the fish are fairly coloured up but still give good scraps in this small pretty stream. 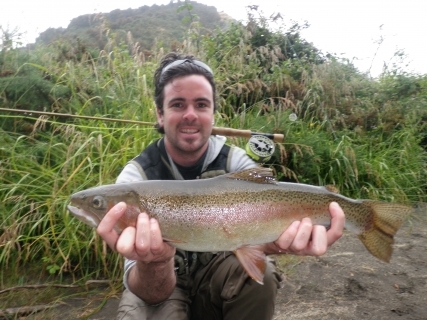 Tongariro has fished well to those who have been regularly visiting it and move around pools until they find small pockets of fish. Summer fishing here is very different to winter and standing in the one spot in your favourite pool will not produce the same way it does for you in winter. Generally there are not a lot of spawning fish running the system at this time of year so what is left in here from the winter is taking up residence and putting on condition so you should expect to catch recovering trout with odd silver fish which has recovered well. ThisÂ is not to say we wont see another run of fish come up with the next rain nor we will not beÂ surprised when we hook into a 8lb brownie which are currently moving as we read. A few big browns have been hooked lately and they can be spotted in Cattle Rustlers so it is only a matter of time before one of these makes a mistake and finds itself on the bank and in some one’s smoker. The evening rise on the Tongariro has been really good as well and most anglers that can stay up late and forfeit there drinking time will come home with some stories of trout feeding hard in the last hour of light. Most small dry patterns will be accepted at the moment and if you fish a small nymph behind that you will not miss!! Places that IÂ like to explore at the moment has been down the braids , Bain pool, Plank pool and high in the river near the Blue pool. Polaroid closely especially in the fast oxygenated water you will be surprised what you are walking past and may boost the catch rate for the day considerably. As I said the pressure on the river has not been great and most of your favourite pools will be free to fish alone and at your own pace. That’s enough for now as I still have a vehicle to pack for guiding in the morning butÂ I will be making more of an effort to try and make the blog regular again and keep you guys up to date with whats going on around the Central North Island.